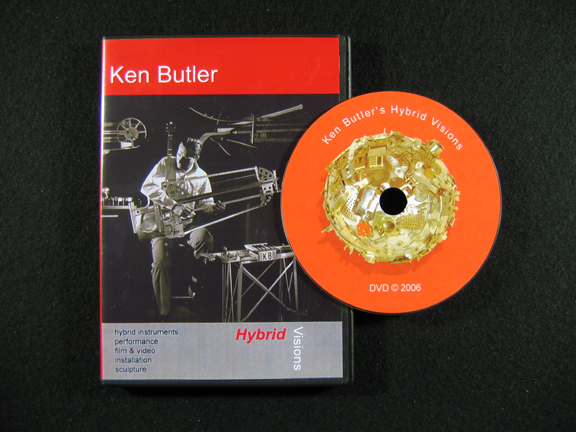 This music is from "Ken Butler's Voices of Anxious Objects", recorded live in the studio in NYC in 1997 and released on John Zorn’s Tzadik label with a 16-page color booklet with photos of the hybrid instruments. With KB-Hybrid strings, Matt Darriau-clarinet, alto sax, gaida, shanai, kaval, reeds, and flutes, Stomu Takeishi-fretless electric bass, Seido Salifoski-dumbek, tapan .... some live looping, no overdubs. Live recordings with the following musicians: KB-Hybrid strings: John Butler-guitar: Stan Wood-Vibraband: Kip Richardson-drums: Dina Emerson-voice: Stomu Takeishi, Glen Moore-bass: Jerry Gibbs-drums: Rufus Cappadocia-cello: Satoshi Takeishi-drums. Live recordings with KB-Hybrid strings: Matt Darriau-clarinet, alto, gaida, shanai, kaval, reeds, and flutes: Stomu Takeishi-fretless bass: Seido Salifoski-dumbek, tapan. Recorded in NYC in 1997 and released on John Zorn’s Tzadik label with 16-page booklet with photos of the instruments. 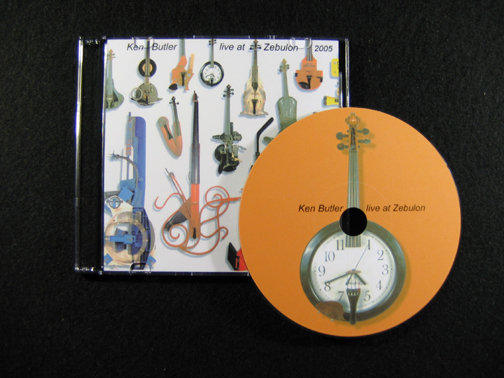 Purchase Ken Butler's 'Voices of Anxious Objects' released by Tzadik Records HERE. Live recordings with the following musicians: KB-Hybrid strings: John Butler-guitar: Stan Wood-Vibraband: Kip Richardson-drums: Dina Emerson-voice: Stomu Takeishi, Glen Moore-bass: Jerry Gibbs-drums: Rufus Cappadocia-cello: Satoshi Takeishi-drums. $20.00 + shipping. Live concert recording at The Kerrytown Concert Hall in Ann Arbor, Michigan with KB-Hybrid strings: Sepideh Vahidi-voice: Jason Beck-percussion. Recorded Jan 30th, 2004, $20.00 + shipping. Live recordings from a year of performances at Zebulon Café in Williamsburg, Brooklyn, with combinations of the following musicians: KB-Hybrid strings: Matt Darriau-gaida, shanai, kaval, clarinet: Stomu Takeishi–bass: Seido Salifoski– dumbek: Haale–voice: Vlada Tomova–voice: Matt Kilmer–percussion. $20.00 + shipping. Excerpts of nearly 30 years of film, video, interactive installations, and performances with the artist’s hybrid instrument sculptures. A full 2hrs. that includes these sections: Voices of Anxious Objects Live and studio excerpts, 2004, 12 min.Lost & Sound Performance excerpts, 2000, 18 min.Live Performances Excerpts New York City, 1996-1991, 33 min. Interactive Installations Excerpts, 1997-1984, 30 min. Hybrid Antics Single-channel video, 1983, 20 min. Hand Song 16mm pixilated film, 1977, 7 min. $50.00 + shipping.